The crucial actors of a global knowledge-based economy are multinational enterprises (MNEs). MNEs depend on the embeddedness in an institutional framework; their competitive advantage depends on the cross-border utilisation of regional and national capabilities. The innovativeness of a company is therefore based also on regional innovation systems. 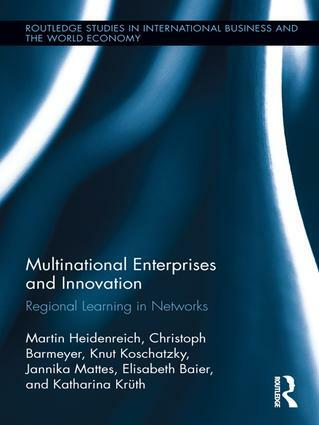 Multinational Enterprises and Innovation contributes to a better understanding of the interconnectedness between organisational and regional learning. On the basis of case studies in Germany and France, this volume investigates how MNEs cope with technical, economic and institutional uncertainties by drawing upon the complementary strengths of organisational and regional networks in national and European contexts. The book links two theoretical debates which are currently still largely disconnected -- the debate on learning processes in MNEs and the debate on the regional bases of innovativeness and competitiveness -- answering the question of how the internationalisation of R&D is reconciled with regional competences. Christoph Barmeyer is Professor of Intercultural Communication, director of the Centre of Core Competences at the University of Passau, Germany and affiliated professor at the research centre HuManiS (Humans and Management in Society, EA1347) of EM Strasbourg/University Strasbourg (France). Elisabeth Baier has studied economics in Gießen, Stirling and Mannheim and works as scientific researcher in the Competence Center "Policy and Regions" at the Fraunhofer Institute for Systems and Innovation Research (ISI) in Karlsruhe, Germany. Martin Heidenreich is Jean-Monnet-Professor of European Studies in Social Sciences and director of the Jean-Monnet Centre of Excellence on Europeanisation and Transnational Regulations (CETRO) at the University of Oldenburg, Germany. Knut Koschatzky is responsible for the Competence Center "Policy and Regions" at the Fraunhofer Institute for Systems and Innovation Research (ISI) in Karlsruhe. Since 2005 he is Professor in Economic Geography at Leibniz University Hanover, Germany. Katharina Krüth studied Cultural Sciences in Frankfurt (Oder) and Cracow and currently is a doctoral student at the University of Passau, Germany. Jannika Mattes studied European Economic and Business Studies in Bamberg and Granada and currently is researcher at the Jean-Monnet-Chair of European Studies in Social Sciences at the University of Oldenburg, Germany. As ever-increasing proportion of the world's business takes place across national borders, the need to understand the motive forces behind international business becomes greater. Transnationals are now, in many cases, as important as national governments in shaping trade flows and economic trends. As this series demonstrates, international business is not just the preserve of the largest companies, but impacts on all aspects of business and economic activity. This series is essential reading for policy makers as well as researchers in international business and applied international economics.